On Sunday we celebrated our daughter and grandsons birthday with a steak and rib cook out. It was one of our good weather days so cooking out was a wonderful option. To go along with that our daughter and family are on the Adkins diet so it was a high protein meal. Lots of veggies and meat, but the special treat was this pink jello salad. My family has made this salad/dessert for years and I remember it at family functions when I was small. If you are carb conscience this maybe a good dessert for you. 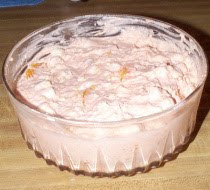 Mix the fruit with the jello then add the cottage cheese. After this is mixed then fold in the cool whip. Chill for a couple of hours. Enjoy and I'll be back tomorrow with a new featured artist. This looks really delicious! Thanks for sharing the recipe.